Nuts can be prepared way in advance (up to 1 month) and stored in an airtight container. Delicious on top of Arugula, Roasted Brussels Sprouts, Butternut Squash & Candied Pecans Salad. 1. 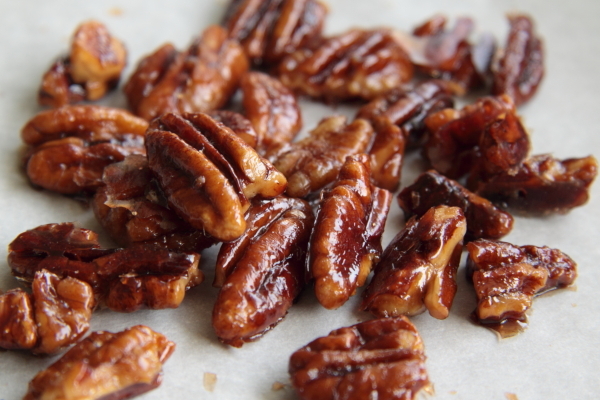 Prepare a large sheet of parchment paper or foil for cooling pecans. 2. Stir sugar, oil, and vinegar in a large skillet over medium heat until sugar melts and syrup bubbles, about 3 minutes. 3. Mix in pecans and stir until nuts are toasted and syrup coats them evenly, 2-3 minutes. 4. Turn nuts out onto prepared parchment paper and separate using 2 forks. Cool completely.